There are two parts of any research proposal, report, or project summary that have to be in pristine condition when they are presented at a conference or submitted as a final report provided to an insurer or auditor of your work. The first is the initial review of your program and its study population. The second is a review of the results of your study, usually in both table and graph form with all subcomponents of your outcome reviewed for such things as validity, reliability and statistical validation. In the case of a program proposal, the most important part of a project is the introduction to the population as a whole and the subpopulation(s) undergoing your review. In the case of asthma for example, a report on the entire population served by the insurer is defined and demonstrated, followed by a description of the subpopulation about to be researched, namely those who have asthma and who are eligible for this particular review according to standard guidelines. Typically this information is presented in a fairly common form, with table and histograms applied in a fairly standard fashion. Although this methodology is perhaps to most common method employed for such reports, it is not necessarily the best way to demonstrate your results in such a way that its stands out as unique and exceptional in format and presentation. This is where the use of a population pyramid comes into play with regarding to most population-based studies of health practices and program performance. The population pyramid is a more accurate way to present the data about your entire and research populations, and to demonstrate in a single figure the percent and amount of people withing your population who will be engaged in such a study. 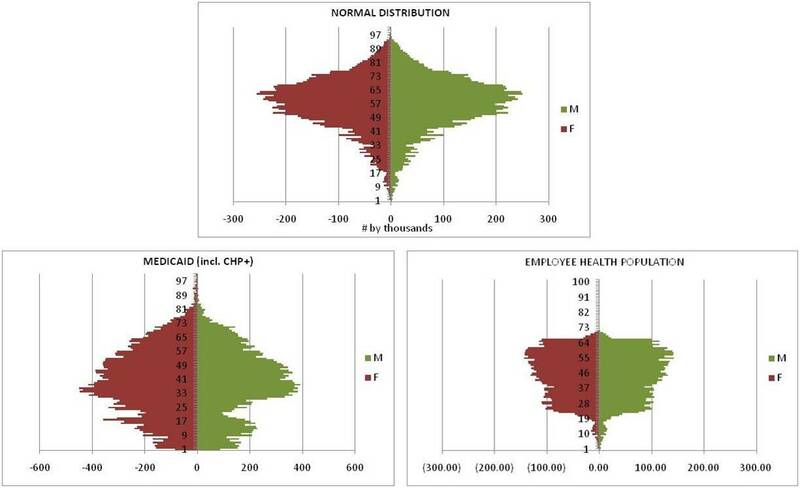 In the following examples, the different methods of depicting the same information illustrate just how the use of a population pyramid graphing technique results in a report that is still understandable to the upper echelons to who you may be presenting, and more importantly to the statisticians reviewing and scoring your work for acceptance as part fo a standard QA program. The following are standard ways to present population data in general. The first depicts ages counted and graphed at a per year level. The second depicts the same, but depicted using bar charts instead, in 5-year increments by gender. The third method is one of the most commonly applied methods of depicting a population’s age-gender make-up, but notice this lacks much details, and when studies in which this type of population description is included measures rates across an age range that cannot clearly be seen using any of these methods, these demographic illustrations may be considered helpful, but of minimal use in terms of the relationship a given project has to the population as a whole, from one age year to another. Since many HEDIS/NCQA projects are picky about the age ranges of their study groups (i.e. 10-17 yo and 18 to 45 yo for moderate to severe asthma reviews), the generation of population bar charts that do not depict the counts for these age ranges add little to the overall report. 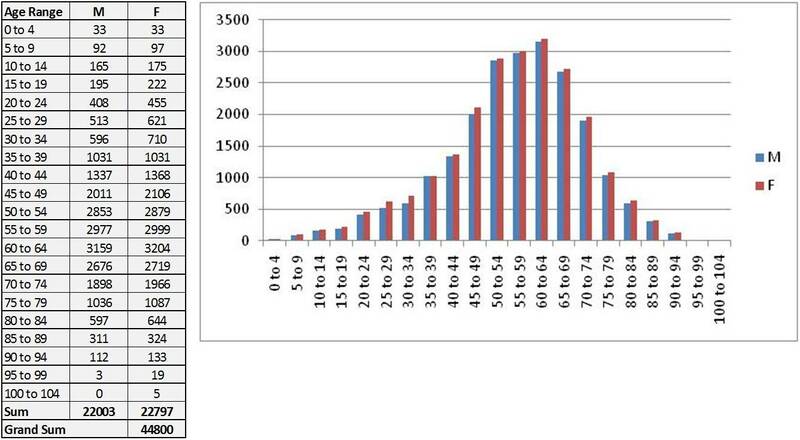 Typically, a researcher compensates for this by providing the 5 or 10 year population bar charts, depicted by gender, along with counts for the required age ranges to be studies, also by gender. The following are examples of population pyramids related to this type of NCQA research, with Females on the left and Males on the right. These pyramids demonstrate how an overall population may depicted with in 5 and 10 year age groups. These depictions also illustrate the slight differences in interpretation that could result from the use of these tools without taking exact year of age into consideration. No two pyramids are alike in population health research. This is especially case for two distinctly different programs. At times, companies merge the information provided by their complete dataset into just one report, detailing the positive and negatives without distinguishing between these two distinctly different social groups. Unfortunately, such analyses are completely invalid in statistical terms due to the probabilities of group-related type 2 errors creeping in. When comparing employed members groups with Medicare/Medicaid/ normally unemployed members’ groups, outcomes are very likely to balance out each other at times. There are of course some health preventive activities that occur in both of these groups, such as skipping visits or scripts, or refusing to engage in a follow-up, but in general, many long-term or chronic disease states can demonstrate differentially for each of these two groups, as well as between different groups within the same subclass. 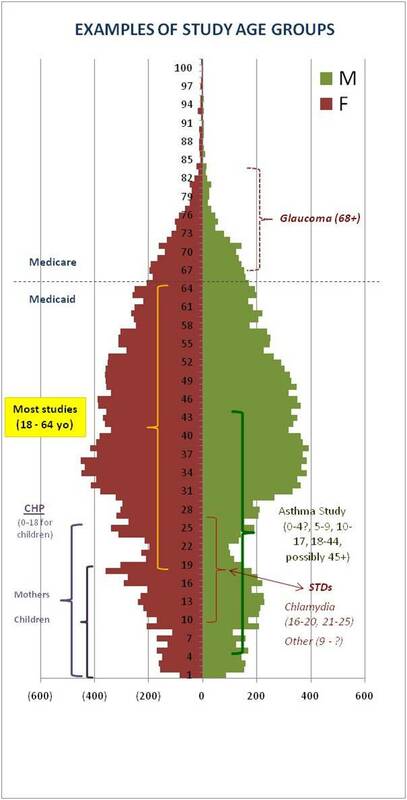 The differences in age distributions alone demonstrate where important age-related differences can occur simply due to the numbers and percentages, and not at all due to the health care program being evaluated. The following pyramids depict in one-year increments the detailed demographics of these two programs–Medicaid Managed Care and Employee Health. The first pyramid details an exceptionally large population of about 16.6 million people; females counts per year of age are presented on the left of the midline, and male counts for the same to the right. The numbers depicted on the scale represent counts of people, by gender, in increments of one year each, in the thousands. This approximates the type of outcomes received by engaging in complete reviews of entries made into an institutional database like those associated with Perot systems or the NDCCM database. The last two population pyramids depict two specific forms of insurance populations typically reviewed using NCQA-defined, as part of the institutional requirements engaged in by QA staff. These pyramids were found to be particularly beneficial for internal presentations produced at the institutional level, and tended to be included on all Annual Reports for each of the programs in need of review. Any reports related to population health reporting also made use of these figures for illustrating purposes, and in the case of public presentations, for providing large amounts of information on one, eye-catching and easy to interpret image. The lower left pyramid represents a typical Managed Care Medicaid Population, including the CHP program often included in many Medicaid Managed Care program reviews. The sizeable number of children in this program is due to the CHP and CHP-like programs often associated with Medicaid programs in general. The somewhat lopsided appearance of members, by gender (Females > Men) is due to a combination of social and qualification related conditions related to this program. Women who are mothers of children covered by CHP are included in the count, as are women in general who have a low-income and who have one or more children not on the CHP program. The lower counts of men than women, especially for the age range of 18 to 25 years old, is due primarily to social behaviors related to children and eligibility. Women are usually more bonded with their children, for which reason they enter the program along with their child. Second, men have social and institutional pressures to either become a more responsible parent of the child in a program, or if not a parent of such a child, engaged in whatever social practices are considered acceptable and expected on behalf of family members regarding job-seeking as well as avoiding reliance upon a state- or federally-sponsored low-income “welfare” program. Many individuals develop a “history” of their illness or chronic disease state between the age of 18 and 30, resulting in an increase in their likelihood of acceptance into such a program, along with an increase in related handicapping and disease-related events used to prove the existence of such a medical condition. For this reason we find the ages of individuals separated by gender increasing their counts as they progress towards to age of 30 to 35 years of age. About this time, morbidity and mortality begin to take hold of the population’s overall health in general, and due to either transfer to another program, early death or total disability onset, or removal from this form of coverage (as part of a recovery or sociomedical “maturation” process). During the 30s, chronic diseases begin to take their toll on people in general, often leading to problems related to maintaining a job, obtaining adequate health services to meet their medical demands, or escalating in symptomatology either physically, psychologically and/or psychiatricially before demonstrating sign of long-term morbidity onsets due to their medical conditions, history and state. The lower right pyramid depicts an employee health population monitored for Quality Improvement, with QA techniques employed according to HEDIS/NCQA standards in order to review the overall health status for this population. The first differences from the Medicaid Population to note are the signficant differences in counts of much younger members (children whose parents work at the facility), and near absence of individual who have passed retirement age. This is due to inclusion of these members as part of a parent’s or relative’s (family health insurance) program. Secondly, it is important to note that there is a fairly even distribution across all age ranges in terms of the employees in general who make up much of this program (often > 90 or 95%). This especially occurs within well-established private insurance programs in which age is not a determinant regarding the likelihood of being hired. It would not be a surprise for example to find that certain topics popular to certain age groups, such as environmentally-oriented programs or many of the popular sports related programs with insurance programs provided or even programs targeting older populations in general, will in fact show some signs of age preference in hiring, and therefore in health insurance coverage. The following population pyramid depicts the test population features for an asthma study. This study followed HEDIS/NCQA guidelines, with the exception of upper age related qualifications. The primary age range reviewed was 5 to 45 years of age, with emphasis placed on two groups with well define behaviors and claims related features for which several institutional, PCP and patient-driven preventive measures were defined and later found to have significant impacts on overall results and improvements in health preventive activities. This figure was modified to present the study population of moderate to severe asthmatics as a subcomponent of bars used to represent the population as a whole. For HIPAA reasons, actual counts were modified in order to prevent identification based on age. The above figure tells us that this population demonstrated outcomes that were important indicators of gender-based behavioral differences. Notice the differences in “hits” for “high risk, moderate to severe asthma” received per gender for men versus women. These differences could for example be due to something as simple as script-related behavioral differences between men and women, or they could be due to the differences in how and why asthma-problems are generated in each of these two populations, such as outcomes related to differences in day-to-day living and recreational activities. The reasons for these differences were ascertained statistically by reviewing the major indicators used to assess overall asthma-related health detailed in the series of questions described previously on another page. This included a return to claims related data in order to determine exactly which types of events qualified these individuals as high risk. The typical HEDIS measures were once again reviewed and proactive preventive activities reassessed in order to define an order for which certain activities had certain impacts on certain age populations. this information, although kept in the records for internal use, were not reported as a part of the final NCQA-like report for various reasons, but mostly due to their use in this fashion for the first time, classifying them as preliminary results linked to a test run. This same methodology was applied to the research of another chronic disease, diabetes. the benefits of this approach were once again related to the depiction of age-specific features and through an evaluation of preventive activities engaged in within the home, clinical, lab and specialized visits settings, demonstrated that the major age groups defined for developing intervention activities for diabetics, based on a ranking of severity of their disease, could be applied to other methods by which their long-term health could be evaluated and, for older versus younger, used to predict the next actions that needed to be taken to prevent an early onset case from progressing too rapidly, in terms of statistical rankings, into an early metabolic syndrome type of health condition. Obviously, this detailed method of evaluation has to be tested at numerous levels within numerous health insurance programs and several more population setting to be certain of what the earliest outcomes for this work predicted back in 2006. This method of reviewing populations will result in more effective outcomes once a series of more detailed analyses are performed using stepwise analytic techniques, instead of the easy and quick methods of evaluation which pay little attention to the details of the various cases. To me this seems to be an obvious route that needs to be taken with the development of these new methodologies, automating these steps as much as possible, allowing for more time to be spent paying attention to details and using that new information as the way to reshape your future outcomes. By implementing the above approach to demonstrating the value of your project, you are more likely to attract supporters for this work due to the fairly simple, more modern look this method of presentation brings to any presentation on this topic. At the risk of referring too much to the few cases of success generated in terms of obtaining perfect scores for reviews as a result of their audits, I suspect that given the right skills and programming tools, these types of outcomes can become more common for managed care programs, and not require costly manpower services to reach such a goal.